You sure can! You probably missed the small type at the bottom of the page (just underneath the "Post a Comment" box) which allows you to subscribe by email. I probably just need to move it to a more prominent spot. Thanks for your interest! Agree, agree, agree. With everything you said. Other than the Jewish roots part. My parents are all over-the-top presents, "Reason for the Season", carol singing Christmas fanatics. I'd rather give up all the things you mentioned. Can't we just exchange one small gift with close famile/friends, bask in the warmth of their company, and eat too much yummy food? Exactly. Hanukkah seems to just take all the good parts of Christmas and leave out or minimize the bad. Except for the weight gain. 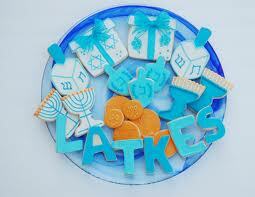 I think Hanukkah could possibly make you more fat. Merry Christmas to you Jo. Have a beer on the beach for me because that sounds just lovely right now.